Y. Pendas & Alvarez Co.
Ysidro Pendas (1844-1902) was a Spanish immigrant from Asturias who learned the cigar business in Cuba while working at La Sultana factory. Y. Pendas & Alvarez Co. was established in 1867 in New York City by Ysidro and Miguel Alvarez (1847-1918) also a Spanish immigrant from Asturias who like Ysidro had learned the cigar business while working at La Sultana factory in Cuba. Lozano, Pendas & Co. established in New York City by Spanish immigrants from Asturias Faustino Lozano Sr. (1842- ) and Enrique Pendas (1865-1935). Lozano left Spain for Cuba at an early age and after learning the cigar business there moved to New York City in 1865. In 1881 Lozano associated with Pendas who was living in NYC at the time and formed Lozano, Pendas & Co. which was the third cigar factory to be established in Tampa in May 1887 after the factories of Vicente Martinez Ybor and Ignacio Haya . Among the incentives offered by the Tampa Board of Trade was a factory building at the corner of 10th Avenue and 15th Street where they were initially established. In 1895 Ysidro's nephew Enrique Pendas became sole owner of the firm Lozano, Pendas & Co. when Faustino Lozano Sr. sold his interest in the company. At that time Lozano, Pendas & Co. ceased to operate and was absorbed into Y. Pendas & Alvarez Co. In 1897 they had outgrown the facilities at 10th Avenue & 15th Street and constructed a new facility at 1416 Spring Street.​ After a few years they outgrew the the Spring Street factory and built this modern factory which was completed in late 1909 or early 1910. The factory closed a few months after opening during the 6 month long general cigar strike of 1910 and reopened in January of 1911 when the strike was settled. Ysidro Pendas and Miguel Alvarez were married to sisters Elizabeth and Julia Hogan and some of their children were involved in the operation of the company. Ysidro died unexpectedly while returning from a trip to Spain and Miguel retired shortly thereafter leaving the operation of the business to his sons and nephews; Ysidro's sons. After Miguel's death in 1918 and the death of the company's bookkeeper C. H. King shortly afterward, the company ceased to operate in December 1918 and on May 20, 1920 was acquired by E. Regensburg & Sons . All rights to the Webster brand, its main brand, were acquired by the Webster Cigar Company of Detroit, MI. E. Regensburg & Sons operated here until 1933 when they closed after a general cigar workers strike. This 41,953 square foot factory building designed by Fred J. James (1870-1932) was built in 1909-1910. It has 8 foot dial clocks on four sides of its octagonal 120 feet high seven-story tower and accommodated 700 workers. 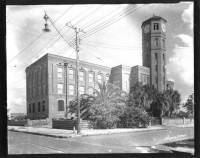 A similar tower is currently only found on two other cigar factory buildings, one of which, The Samuel I. Davis factory building, is of a similar design. The Hillsborough Box Company bought the property in 1946. The factory is currently occupied by the Tampa Tarp and Florida Umbrella Co.